New Delhi: With uncertainty looming over fate of Lokpal Bill in Rajya Sabha, Government on Thursday hoped that all allies will come around and help in its passage so that possibility of convening a Joint Session of Parliament does not arise. 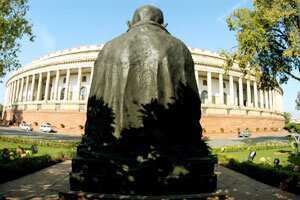 The bill was cleared by the Lok Sabha on Tuesday. Narayansamy said finance minister Pranab Mukherjee has spoken to leaders of Trinamool Congress, which have given notice for amendment to the crucial legislation, and has explained the situation to them. Trinamool Congress, which has 6 members in the 243-member Upper House where the Congress and its allies do not have majority, wants removal of the provisions relating to the setting up of Lokayuktas in the state which is contained in the Bill passed by Lok Sabha. Narayanasamy said it has been made clear that the Lokayukta aspect will not come into force without consent of the state and added, “I think they will all come around." Asked if the need for a Joint Session of Parliament for passage of Lokpal Bill would arise if it failed in Rajya Sabha, he said, “I don’t visualize that situation." Asked whether reference to Lokayukta in the bill could be deleted as demanded by the Trinamool, he emphasized the bill has been prepared after discussions with all parties as also allies and in the light of the commitment given by the Prime Minister on the floor of the House on the issue of Lokpal and Lokayukta. Asked whether parties like SP and BSP would stay away as had happened in Lok Sabha, the minister said he was not aware of the strategy of these parties but the government would like support of all parties. Against the backdrop of the embarrassment suffered by Congress in Lok Sabha due to absence of a dozen odd members, he said the scenario is unlikely to be repeated in Rajya Sabha as efforts are being made for the presence of all. “One or two members are indisposed," he said, adding efforts would be made to ensure presence of everyone.